1 1/4 cups raw sticky rice (sweet or glutinous rice). Use Thai sticky rice if possible. Wash and rinse the sticky rice well. Add enough water to the rice so until the water is about 1/4″ above the rice surface. Cook rice in an automatic rice cooker or in a bowl in a steamer. Do not open the rice until fully cooked (about 20-25 mins). Heat, on low, 3/4 cup of coconut milk in a small saucepan. Add sugar and 1/2 tbsp salt to the coconut milk and cook until dissolved. Remove from heat and pour into cooked rice. Stir to mix well and set aside to let stand for about 15 mins. Heat the rest of coconut milk and add salt. This makes the topping sauce. To serve, place sliced mangoes on a side of a serving disk. Spoon some seasoned sticky rice on the other side. Top the rice with 1 or 2 tsp of coconut sauce and serve. Peel the bananas and chop into 2in/5cm segments. In a saucepan, heat the coconut milk with the sugar and salt, and cook gently until the sugar dissolved. Add the banana pieces and cook gently for 5 minutes. Divide the mixturee into 6-8 small bowls and serve warm. Mix the rice with the coconut milk, milk, lime rind and sugar. Pour the rice mixture into a lightly greased 2.1/2 pint shallow ovenproof dish and dot the surface with a little butter. Bake in the oven for about 30 mins. Remove and discard the lime rind. Add the pinch of star anise stir well and return to the oven. Cook an additional 1 to 2 hrs or until almost all the milk has been absorbed by the rice and a golden brown skin has formed on the top of the pudding. Serve warm or chilled. Serve with fresh or stewed fruit. In a medium-size saucepan, combine the banana and fruit slices, water, honey, vanilla, cinnamon and nutmeg. Bring to a boil, reduce the heat, and simmer for 10 minutes, or until quite tender but not mushy. Add the rice and milk and mix thoroughly. Bring to a boil and simmer 10 more minutes. Serve warm. Heat a small non-stick frying pan until hot. Add the coconut and cook, stirring constantly, for about 1 minute until lightly coloured. Remove from the pan and allow to cool. Heat the butter in a large fring pan until it melys. Add the ginger and orange zest and mix well. Peel and slice the bananas lengthways. Place the bananas cut-side down in the butter mixture and cook for 1-2 minutes or until the sauce mixture starts to become sticky. Turn to coat in the sauce. Remove the bananas from the pan and place on heated serving plates. Keep warm. Return the pan to the heat and add the orange liqueur, stirring well to blend. Ignite with a taper, allow the flames to die down, then pour over the bananas. Sprinkle with the coconut and sesame seeds and serve at once, decorated with slices of lime. Note: This is a hot weather dessert, and you can serve it over ice cubes to make it really cold. Peel and segment the oranges, ensuring that no pits, pith or skin remain. Put the segments in a glass dish and set aside. In a small saucepan, bring the sugar and water gently to the boil, stirring occsionally. Boil for 15 minutes, until it is the consistency of a thin syrup. Add the rosewater and stir to blend. Pour the syrup over the orange segments and chill until required. Star anise is used as a flavoring and as a garnish. It’s a seed pod, brown and star-shaped. Do not eat it. Orange flower water is available in the liquor sections and in specialty foods sections. Combine first 3 ingredients in medium saucepan. Stir over medium heat until sugar dissolved. Simmer until liquid is reduced to generous 1 cup, about 15 minutes. Remove from heat and stir in orange flower water. Cover; chill until cold. Discard anise. The above syrup can be made 1 day ahead. Cut peel and pith from oranges with knife. Slice oranges crosswise into 1/3-inch rounds. Set in bowls. Spoon syrup over. Top with mint. Make day before or morning of. The unusual ingredient for Boua Loy is glutinous rice flour. Beside that we will also need some brown (if possible) sugar, or some even healthier sweetener. Also an egg, some coconut milk and a bit of salt. We will have to make some dough from the rice flour and the trick is to get this dough just right. You start out with some of the flour that you mix with some water in a big bowl (OK, not THAT big – just a bowl.) and mix it well until you have something that resembles a dough. It will probably be rather sticky to your hands if you touch it. Now start to knead it by adding small amounts of the flour, until the dough transforms into a big blob that you can knead without it sticking to your fingers any longer. Then it’s right. Now form little balls of about half an inch from the dough. This is a nice job while you watch your favorite soap (it you like that stuff, that is). I don’t really know how much flour you have to start with (in ounces or grams) but I usually plan the ingredients so that I end up with about two hands full of these little balls. Now you boil some water and give the little dough balls into it. They will magically float up when they are done. Take them out, drain them, and put them into some boiling coconut milk. Add sugar and a little salt ’till it’s just right for your sweet tooth. I like to add an egg or two. I put them into the still boiling coconut milk whole without stirring so that they are poached. That’s it for this little mouth teaser – the feel of the little balls in your mouth is really unusual and – yes – funny. 1. The filling: mix the ingredients and cook them until it looks right. 2. The wrapping: mix the flour with warm water. Use your hands to beat it until it is well blended. Make balls of 1/2 inch diameter before flattening it thin enough to wrap the filling ball. 3: The topping: Mix the ingredients and heat it at medium temperature. Constantly stir it with spatula until it begins to set. 4. Put the wrapped ball in a small paper cake cup and top it with the topping. 5. Steam all these cups for about 10 minutes. Serve when it is a bit cooled off. Save two tablespoons of the flour and mix the rest with water, 1/2 can of coconut milk, and some water to make medium-blended mixture. Also mix the rest of the coconut milk (1 1/2 cans) with salt and the two table spoons of rice flour. Pour the first mixture in small cups (about 1 inch diameter). Make sure to leave about 1/4 of the cup for the topping. Steam the cupped mixture for about ten minutes before adding the topping mixture. Continue steaming the cups for another 10 minutes. Take the steamer our of the heat and let it cool down to room temperature. When serving, use a small and thin spatula to take out the dessert. From the side, there are two layers of the cup-shaped dessert. The “body” should have a dull white color while its topping should be whiter. The “body” tastes sweet as constrasted with the topping , which is salty. In China or Japan, these kinds of tiny cups are plentiful. In the US however, it is not easy to get them. I used to see them on sale at some Thai grocers. In Thailand, they also use cups which are wide with a shallow depth (shaped like of cocktail cup). Deeper cups may have effect on the combination of the tastes of the “body” and the topping. The preparer needs to adjust accordingly the amount of the two. Note: While this custard can be made in a bowl, you can really impress your guests by baking it inside a small, hollowed-out pumpkin, squash, or young coconut. It can be served with sticky rice, if wished. Dissolve the sugar in the coconut milk, add the rosewater and salt and stir. Add the eggs (or beated egg whites) and mix well. Pour the resulting custard into a bowl or a scooped out pumpkin, squash shell, or yourn coconut. Put in the top of a preheated steamer and cook for 30 minutes, or until set. 1. Beat the eggs wih coconut cream and sugar until the mixture is frothy. 2. Cut the top of the pumpkin in square shape to make cover , look like a bowl with a cover. 3. Pour in the coconut cream mixture. Cook in the steamer for about 30 minutes. 4. Leave to cool or keep in refrigerator to make the custard firm. 2. To make pandan green colouring, slice the pandan leaves and Pound or blend with 1 cup of jasmine essence water. Remove it’s chip. 3. Heat the jasmine essence water and coconut milk in a pot, stir frequently until cooked. Leave to warm. Pour into a big bowl. 4. Put all kind of flour into the bowl and knead well. Set aside. 5. Boil the sugar and jasmine essence water, simmer until the syrup become thick. 6. Separate the flour into two bowls. Mix the colouring with the first part of flour. So one part of flour is green another is white. 7. Pour white flour into a tray to make the first thin layer and steam. Remove from the steamer. 8. Pour green flour into a tray to make the second thin layer and steam. Remove from the steamer. 9. Repeat 6. and 7. again and again until fine. The last layer should be green. 10. Leave to cool , cut into pieces to serve. 2. To make the syrup. Boil sugar and jasmine essence water. Leave it to cool. 3. Slie the water chestnuts into small pieces. 2. Slice the water chestnuts in dice shape and soak in the red food colouring and stir until bright red. 3. To make the syrup. Boil sugar and jasmine essence water. Leave it to cool. 4. Put the flour in a plate and add the water chesfnuts and shake so the pieces become well coated. 5.Heat 5 cups of water to the boil, add the water chesnuts. It will float when cooked and look like rubies. Drain and plunge in cold water immediately. 1. Sift the flour into a hill on a clean surface. Make a well in the middle and add in egg, melted butter, ice water and salt. Use your hand to incorporate the mixture into a dough. Knead until the dough is soft and form into balls about the size of a duck’s egg. Roll lightly in oil and let rest for three hours. 2. When you are ready to make the roti, roll each ball of dough as thin as it will go, forming a flat disk. Make a pile as you go. 3. Warm frying pan at high heat. Add in oil. Place in the roti, flatten with heavy plate if it puffs up. Fry until light golden brown on both sides. Remove the roti from the pan, sprinkle with a little sugar and drizzle with the sweetened condensed milk. Rince rice until water clears. Cover with at least 2″ water and soak 4 mor more hours. Place in heat proof bowl with room enough for the rice grains to expand about a third more than uncooked bulk. Add small amount boiling water, just enough to cover rice. Steam rice–place bowl in large pot, put trivet on bottom along with 2″ water. Heat coconut milk, sugar, salt in saucepan. When rice is cooked and still hot add 1/2 the coconut ‘sauce’ and thoroughly coat the rice. Reserve remaining sauce for spooning before serving. For a more pudding-like texture, boil rice instead of steaming. *Sugar pumpkins can be found in the produce department or at a farm stand. They are not jack-o-lantern pumpkins but a sweeter, smaller variety grown for cooking. 1 Halve and seed pumpkin. Cut each half into four equal pieces. In a large pan steam pumpkin in one inch of lightly salted boiling water for 15 minutes. Drain in colander. 2 While pumpkin is draining (and cooling enough to handle), mix Coconut Milk, sugar, cardamom, cinnamon and salt in same pumpkin pan. Bring to a boil and actively simmer, stirring frequently until sugar is dissolved. 3 Slice or peel skin from pumpkin and cut into small bite size squares. Add pumpkin to coconut sauce and simmer for 10 minutes. Bring to room temperature and refrigerate. 4 Delicious served slightly warm or cold. For an extra festive treat, top pumpkin dessert with whipped cream or serve with a side of warm gingerbread. 1 Preheat oven to 300° (150 C). Lightly butter a 9″ x 13″ pan. 2 In a mixing bowl, beat eggs and sugar well. 3 Add Coconut Milk, Soft Jasmine Rice, milk, vanilla extract, coconut extract, salt and nutmeg. Mix thoroughly. 4 Make a “water bath” by placing the baking dish into a large pan that has an inch of hot water in it. 5 Pour the pudding mixture into the baking dish. Stir so all the rice is evenly distributed in the pan. 6 Bake for 20 minutes. Stir pudding to mix the rice again. Continue to bake for 40 more minutes or until the pudding is set or firm to the touch. Thoroughly mix the rice flour and sticky rice flour along with fresh water. Leave sit for some time. Squeeze the fresh coconut meat with water to obtain 2 cups of coconut cream. Add salt and sugar. This coconut cream will be used for the topping later. Each ceramic baking tray has several cups with lids. The entire set must be put on top of a charcoal stove. Clean the tray neatly and dry it. Each cup is wiped with vegetable oil. When the baking tray becomes hot, add the mixture to the level of 2/3 in each cup. Add coconut cream to the top along with onion and cover with the lid. Each piece of Khanom Krog can be put together to form an oval bite – sized piece. *can be substituted with muang bean or pumpkin. Preheat the oven to 375 degrees. Beat eggs in the blender for 2-3 minutes; Add sugar and coconut milk, go on blending for another 2-3 minutes. Add taro, still go on blending. Finally, add corn starch and mix it together with other blended ingredients. In a pot, heat this mixture with low heat, slowly stir it until the mixture becomes thickened. Remove from the stove and pour it on a pie pan. Make sure that the pan is of the right size so that it allows the mixture to lay about 1 inch thick. Bake for 35-4O minutes. Remove and top it with the fried onion shreds while the custard is still hot. Some put the onion on it a few minutes before the custard pan was taken out from the oven. The custard or Kha’NOm+Moo”Kaeng should be left cool before serving. Cut the custard in 2″ x 2″ square and put it on a nice saucer with a small spoon for an individual serving. To prepare the onion shreds, first peel red small onion, wash it with water and cut it into thin wedges. Heat two table spoons of cooking oil in a wok. When the oil is heated, put in the wedged onion and fry it back and forth until it becomes golden brown. Take the shreds out of the pan. Leave them on a plated paved with a paper towel to let the oil soaked off. Note: The above recipe is the result of a long time past experience and consultation with some cook books including the one by Prayad Saiwichian, one of my colleages at CMU, FAVORITE THAI RECIPE, Chiangmai, Thailand: Thanabhan Printer, 1988. The recipe on Kha’NOm+Moo”Kaeng in on page 73. While Thais enjoy one-dish snacks and quick dishes from small pavement stalls while out and about during the day, some other snack dishes are normally prepared and served at home or in the workplace. On a typical family veranda, many central and northern Thai families will enjoy traditional snacks with their visitors, seated on a colorful mat around a low khantoke table. Some of these traditional snacks, such as Miang-Come (Roasted Coconut Wrapped in Leaf with Sauce or Leaf-wrapped Savories), go back many years and involve lots of chewing, good for conditioning the gums and exercising the jaw, which is known to help prevent wrinkles. Nowadays several Thai restaurants offer Miang-Come as an appetizer such a Plub Pla or The Gallery Restaurant in Chiang Mai. A true Thai snack follows several important codes: It must be served in a way that includes more than one person. It must be easy to eat, not requiring extra plates and utensils. Of course, it must be delicious enough to tempt somebody away from whatever they happen to be doing for a few minutes between breakfast and lunch, or lunch and dinner. The ingrediates must be fresh and unprocessed this ain’t a bag of potato chips! It must be quick and easy to prepare and arranged in an attractive way. Like most traditional Thai snacks, the ingredients of Miang-Come are chosen to complement each other both in taste and in health benefits. Ginger is well known as a natural aid to digestion, and any number of the edible leaves that can be used in the recipe offer some sort of herbal benefit. In a saucepan, combine and heat the shrimp paste, shallots and galangal until you smell the aroma, then let it cool. Blend the shrimp paste, shallot and galangal mixture with the coconut, peanuts, shrimp and giner in a food processor, or, if you really want to do it the old-fashioned way, pound the ingredients with a mortar and pestle. Pour the contents into a saucepan, adding the sugar and water. Mix well and keep stirring as it comes to a boil. Reduce the heat and simmer while the mixture shrinks to about a cup, then let it cool. Pour the sauce into a small, decorative serving bowl and arrange the edible leaves, dried shrimps, limes, shallots, small hot chilies, peanuts, gingers and roasted coconuts in separate, very small bowls around it on a medium sized platter. Leaves can be from a variety of edible Thai tree foilage, including Cha Plu (piperaceae) and Thonglaang (coral). Lettuce leaves can also be used as a substitute in the west. 1/3 cup sweetened flaked coconut and roasted walnut for garnish. In a 2-quart pan, combine sweetened condensed milk, coconut milk, and flaked coconut; bring to a boil. Reduce heat to low, stirring once or twice; simmer for 5 minutes. Add glutinous rice and cook, stirring occasionally, until rice absorbs liquid. Remove pan from heat and cover. Toast coconut for garnish: Spread coconut in a pie pan and toast in a 350 degree F oven. Stirring frequently, until lightly browned, 4 to 5 minutes. To serve, scoop rice into bowls and sprinkle with toasted coconut and garnish with roasted walnuts. Adapted from Quick and Easy by Martin Yan (Chronicle Books). Copyright © Yan Can Cook Group, 2005. Red Ruby is called tub tim krob in Thai. It’s famous dessert in Thailand. 1. Place water chestnut pieces into a bowl and add red food colouring, mix well and leave to soak for 5 minutes. 2. Spoon tapioca flour into a plastic bag and add the water chestnuts. Shake well to coat the chestnut pieces leaving them in the bag until required. Remember to shake off excess flour before cooking. 3. Bring a large pan of water to a rolling boil and add half the chestnuts at a time. Stir to separate while cooking which should be done when the chestnut pieces become translucent (2-3 minutes). 4. Scoop out chestnuts and place into a basin of ice cold water. Then drain and place into the sugar syrup mixture, this prevents the mock pomegranate seeds sticking together. 5. Place sugar and 400ml water into a pan and bring to the boil. 6. Add coconut milk and cook over a moderate heat to scalding point. 7. Add salt and remove from the heat, stir well and allow to cool quickly. 8. Cover with clingfilm until chilled. 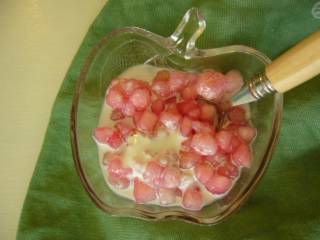 To serve, place a tablespoon of mock pomegranate in the bottom of a bowl and spoon sufficient cold coconut milk to cover. 1. Steam scrape coconut fruit for 5 minutes. 2. Knead sticky rice flour by add floating jasmine water little by little. 3. If you want many color, you can separate the flour and add color on. 4. Pick flour for sculpt it, make it circle then press it to flat shape and boil it. 5. Laddle it and add greenbean in the middle, then fold it to half circle or maybe roll it. 6. Roll over it with scrape coconut fruit. 7. Mix sugar, parch sesame and salt. 8. When serve, sprinkle it with ingredient no.7 and some greenbean if you want. 1. When knead the flour, should sure that it very soft otherwise if it cool, dessert will be hard. 2. Careful the greenbean will come out from the middle of dessert. 1. Mix sugar and jasmine water, fiter with white and thin fabric then simmer it until it sticky. 2. Mix coconut milk with big tapioca, Singapore Lod Chong, Klong Klang and jackfruit. Thai desserts besides artistic they still have a good meaning and valuable that’s why many auspicious ceremony still has Thai dessert as a need menu. This time Thai people has celebrated for the Queen which complete 74 years old so they altogether make this superb 9 layers of Thai dessers. I will explain which dessert in each layers. From the bottom, this called Kha Nom Chan which has meaning of promotion of your work. This called Khanom Tuay Fu which has meaning of progress of work and life. This called Phoy Thong which has meaning of living long. This called Thong Yib which has meaning of rich and wealthy. This called Thong Yod which has meaning of rich in the long run. This called Med Kha Noon which has meaning of support in your life and work. This called Thong Eak which has meaning of the one. This called Sa Neh Chan which has meaning of love and beautiful. 1. Knead rice flour with pandanus squeeze and red lime water, add it little by little until it well combine. 2. Filter with white and thin fabric. 3. Add ingredient no. 1 to brass pan and put it on fire. Stir it until it sticky but do not let it too dry or waterly. 4. Pour cool water to basin. 5. Pour ingredient no. 3 to can which has medium hole around the bottom then press and let ingredient come out from that hole to cool water. 6. Try to change water if you see it become hot. 7. Mix coconut milk with palm sugar and salt and boil it. 1. Mix rice flour and tapioca flour with water then paddle it on fire when cooked, put it down and knead it, mix little tapioca flour. 2. Separate the flour and add your color on. 3. Sculpt the flour like worm then steam it in Thai steaming pot until it cooked. Then admix it with scrape coconut fruit. 5. Mix concentrated coconut milk with salt, parch sesame and sugar. Even glutinous rice dumpling or Ba Chang is not Thai dessert but you can buy and taste it anywhere especially around China town. Thailand also has a big china town and there’s many Chinese oversea in every city. On Lunar Calendar Festival, evevry chinese oversea will prepare to do glutinous rice dumpling at home. 1. Cut the belly pork into 10 large chunks and marinate for 2 days with 2 teaspoons five-spice powder and 1 teaspoon salt. 2. Wash and drain the glutinous rice. 3. Mix well with some of the seasoning (1 1/2 tablespoons spicy salt, 1/2 tablespoon sugar, chicken cube, oil and pepper). 4. Soak the mung beans in water to clean. Drain and add the remaining 1/2 tablespoon each of spicy salt and sugar and mix well. 5. Wash and soak the Chinese mushrooms. Remove the stalks and mix well with the Chinese mushroom marinade for 20 minutes. Steam for 10 minutes. 6. Wash and boil the lotus and bamboo leaves until soft. 7. Drain and towel-dry. Place 3 bamboo leaves on a lotus leaf. 8. Put a layer of glutinous rice on the bamboo leaves and add a layer of mung beans. 9. Top with a preserved egg yolk, a piece each of belly pork and roast duck and 2 cooked Chinese mushrooms. 10. Cover with a layer of mung beans and another layer of glutinous rice. 11. Fold in the leaves to form a square dumpling, then tie firmly with straw. 12. Prepare a deep saucepan and line with several bamboo leaves. Put in the rice dumplings, then fill with enough water to cover them. 13. Use high heat to bring the water to a boil, then reduce to moderate heat and continue to boil for 6 hours. It’s appearance like pot made from aluminium. It has 2 or 3 layers, bottom layer use for add the water, since second layer up will has big hole around the layer for let the vapor make the foods cooked. It’s lid has high vase. Before buying it you should check that all part no have dent and leak, tight covering and every layer can overlap. Pour the water to the bottom layer about half or 3/4 of pot then overlap the second layer and put the food or dessert on, but do not arrange it too adjoin because we need the space for vapor then cover it. When food cooked you should open the lid carefully because the vapor on lid will drop on food that make the food has dent, not beautiful. If you want to go on steaming you should dry up the lid before cover. 1. Mix coconut milk and sugar together, put it on fire and let it melt then filter it white and thin fabric. After that put it on fire again and wait until it boil then take it down and leave it cool. 2. Mix rice flour and crush palm fruit together while knead you need to pour coconut milk little by little until the flour soften then add all coconut milk to. 3. Cover the flour and bask it in the sun about 3-4 hours, flour will leaven. 4. Laddle flour to small chinese cup or banana leave vessel then sprinkle it with grind coconut which mixed salt. 5. Steam it for 15 minutes. Let it cool down and serve. 1. Mix flour with baking soda and sift it then add yeast. 2. Mix sugar, salt and ammonia to water, stir it until it melt and mix well. 3. Pour ingredient no.2 to flour (no.1) then knead it until it mix well. Leave it for 4 hours. 4. Sculpt flour to round shape and press it then fry it in hot oil for a while or until it changes color like picture. 1. Pound burned cococut coir then mix it with 10 cups of water and then filter it with white and thin fabric. You will get black color from nature but if you cannot find and burn coconut coir you can use artificial food color instead. 2. Knead sticky rice flour with black water (no. 1), knead it until it mix well then add coconut milk and sugar, stir it until it mix well again. 3. Put ingredients no.2 to brass pan and put it on fire, use medium heat. Paddle it until it sticky and start to mix well then turn off fire but still continue paddle until it’s not sticky with pan. 1. Soak soybean in hot water about 1-3 hours or until it inflate. 2. Take all crust and clean soybean. 3. Blend soybean, while blend add water little by little. Then filter with white and thin fabric. 4. Put soymilk on fire, always stir it. If boil put it down from fire. 5. Burn calcium sulfate then pestle it. Sift it one time before use. 6. Mix tapioca flour with calcium sulfate and water 1/4 cup to pot which you let soymilk hard. 7. Strongly pour soymilk to pot (ingredient no.6) and do not stir it. Let it hard without move or shake. Clean ginger and pound it lightly, add it to water and boil it. 1. Mix gelatin powder with floating jasmine water to pot. 2. Put the pot on fire and stir it until gelatin melt. 3. Add sugar and stir it until it melt then filter it with white and thin fabric. 4. Put gelatin on fire again and simmer it until it sticky then put it down from fire. 5. Split gelatin for mixing with food color. 6. Pour gelatin to mold or tray and let it become stiff. 7. Cut harden gelatin in little piece. 1. While mix the ingredients, you can prepare the steamed pot by put it on fire. 2. Mix blended ripe banana with rice flour and tapioca flour then knead it by your hand. 3. Add sugar, salt and concentrated coconut milk then stir it. 4. Add 3/4 cup of scrape coconut fruit. in the khanom krog recipe, what do you mean about the 2 teaspoons of clear in the ingredients list?